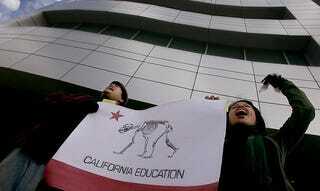 Today was the day Cal State students protested a fee hike. This is sadly common everywhere. All UC and Cal State schools have hiked fees in response to recession and the subsequent budget cuts. But I will start from the premise that a society like an organism needs to propagate to survive. The best, the only chance for the society to keep on running is if its children grow up to take care of it. If this doesn't happen, the society will die. So it makes no sense to pass on the society's burdens not only to its most vulnerable—children and young adults who are not part of the work force and can't contribute practical things to the society yet—but to the future leaders, entrepreneurs, artists and keepers of the society. Shackling them with debt inhibits their creativity and changes their life's path. Instead of going into medicine where she could have discovered the next cancer drug, have found the next cancer drug, a gifted student from an impoverished family had to forgo med school because she already had too much student debt, and thus a boon to society is lost. If I were a politician with some real power, I would not cut education at all. I would plan for times of recession by asking my constituents to spend less and pay more in taxes, and I would find other ways of funding the government so that important, no, vital areas of society, like education would not be cut. If government spending and politics is more complicated than that, I wouldn't care; I would make it simple. This is a mark of what society, i.e. all of the people in it, believes in. If they don't believe in education, then their values are seriously misaligned and the people in that society have become diseased with greed, ego, narcissism, and selfishness.